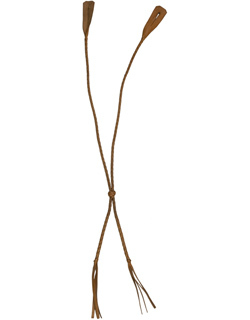 The Bushman is a classic Australian stockman's hat, worn in the outback since before 1900. It is related to the old snap brim Fedora, and was the first hat imported by Akubra from England. 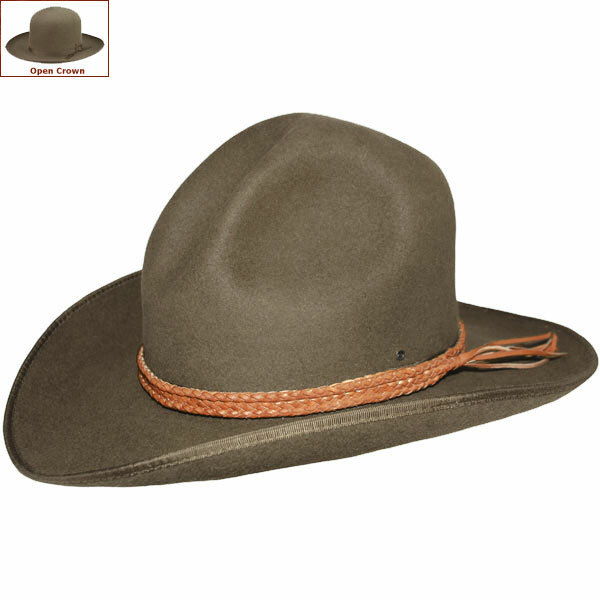 It was also the first hat made by Akubra when they started manufacturing in the early 1900s. It was one of the first hats we sold in the 1960s, and it continues to be appreciated both in Australia and America for its simple, straightforward style, and its practical comfort. 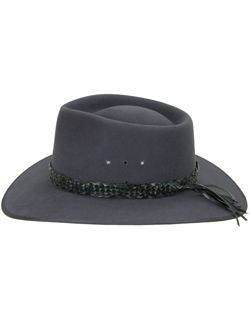 The Bushman is made in Akubra's Imperial Quality pure fur felt, fully lined, with chin strap hooks. The brim is 3¼ inches wide, bound edge. The brim snaps down in front to better shade the eyes. It is supplied with a half inch ribbon band. The colors are Nullarbor Tan (a dark beige), named after the great Nullarbor Plain of Western Australia and Moonstone, a mid-gray. 5½ inch open crown, shipped uncreased. Reeded roan leather sweatband. UPF rating 50+. Made in Australia. Shape the crown to your desired shape. Heads come in all sizes, and in a surprising variety of shapes. Although fur felt hats are adaptable, and will usually conform to differences in shape with a little wearing, it is essential that the size be correct for the head. To determine your hat size, measure the circumference around your head, keeping the tape level and firm, across the temples and above the eyebrow ridges. Check the size chart given below. For in-between measurements use the next size up. 1. The sweatband inside the hat should fit securely on the head without binding. 2. For some in-between sizes, and for some head shapes, greater comfort may be attained by placing felt pads inside the sweatband. Felt pads are enclosed with Akubra hats. 3. The top of the crown should not be so low that it touches the top of your head and prevents the hat from coming down far enough to seat properly. If it does, with a leather or cloth hat you may need a smaller size. With an Akubra fur felt hat the top can be adjusted. Check the information sheet supplied with the hat. If the hat does not fit, recheck your hat size, and exchange your hat for the correct size. Hats in unused condition with all tags can be returned within 90 days of purchase for exchange or full refund of product price. Akubra Hats are made to be worn by active outdoorspeople. They are made to give full satisfaction during years of service, through sun and rain. There is no need to baby your Akubra, but if you treat it with understanding, it will look better and last longer. Do not pick up your hat by pinching the crown, either at the top or front. Pinching will flex the felt, and eventually cause a hole or crack to develop in the felt. It is best to pick up the hat either by the front and back of the brim, or by placing the thumbs inside the leather sweat band at the sides with the fingers just touching the outside edge of the brim. Rain or sun do not harm a pure fur felt hat. There is no need for plastic rain covers -- these merely keep the felt from breathing properly and so make your head uncomfortable. Do not heat a wet hat. Heat will shrink the felt, as well as the leather. Stand the hat upside down on its crown, or hang on a hook in a cool place and let it dry naturally. Wet felt retains the shape in which it dries, so make sure the brim and crown are shaped as you want them before drying. Do not leave a hat standing flat on its brim, as this will distort the brim. Never put your hat on the back ledge of your car or truck in the sun, as the heat may shrink and damage the leather sweatband. If your hats must of necessity be dried or stored under warm conditions, storing the hat on a Hat Stretcher, set to your hat size, will be beneficial. Dust and grime are bound to accumulate on a hat under any normal conditions. Dust can be removed by brushing with a soft brush. Always brush with the nap, in a counterclockwise direction. Dust can also be removed by wiping the hat with a damp (not wet) towel. The Akubra hats with an open crown allow you to put your own personal bash or crease in the crown. A hat maker would use steam to make the shape permanent but steam may also shrink the felt. The better way for those who are not hat makers is to put in a preliminary shape, then when the hat is damp from the rain adjust it to the desired final shape and let it dry. 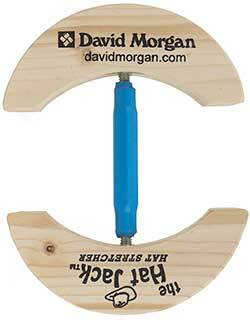 This not only avoids shrinkage problems, but also lets you try out the preliminary shape and change it if needed. Please refer to our online instructions: "Bashing your Open Crown Akubra" or download our Hat Manual for more help.